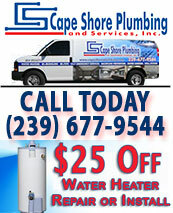 The bathroom toilet plumbing professionals at Cape Shore Plumbing and Services, Inc., are experts at toilet repairs for clogged, leaking and overflowing toilets. While it may seem that bathroom toilets are fairly simple fixtures to understand, in reality there are many components that can break down or fail completely. When this happens, you’re forced to endure the inconveniences caused by bathroom toilet plumbing that malfunctions. One call to the plumbing specialists at Cape Shore Plumbing, day or night, weekday, weekend or holiday, and you are on your way to free flowing bathroom toilet plumbing. The Highly Qualified Plumbing Contractors at Cape Shore Plumbing Thoroughly Inspect Your Toilet for Proper Diagnosis of the Bathroom Toilet Plumbing Problem and to Expedite Complete Restoration of Bathroom Toilet Plumbing System. While some of these problems may not seem serious to the untrained eye, the licensed, insured plumbing specialists at Cape Shore Plumbing know that there could be a more-far reaching effect than what appears as a simple toilet clog or overflow. There may be a leaking toilet seal, or a malfunction in the toilet plumbing pump. Left untreated or not treated properly, these problems could cause damage to floors, sub-floors, walls and ceilings. When you call SWFL’s bathroom toilet plumbing Professionals, you will receive a thorough evaluation and diagnosis of your bathroom toilet plumbing system and expeditious toilet repair. Once the problem is diagnosed, our experienced team of plumbers will make the necessary toilet repairs with speed and precision so that you can keep your bathroom toilet plumbing flowing! 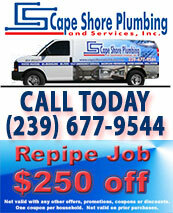 Cape Shore Plumbing's 24-7 response team stands at the ready. As soon as your toilet overflows, you experience toilet clogs, you see signs of a leaking toilet seal or a malfunctioning toilet plumbing pump, call SWFL’s 24-7 bathroom toilet plumbing professionals at (239) 677-9544. By doing so, you can rest assured knowing that the bathroom toilet plumbing response team at Cape Shore Plumbing will perform your toilet repair or replacement correctly the first time. 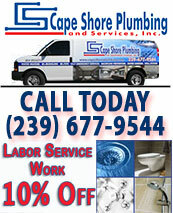 Remember, Cape Shore Plumbing is properly licensed and insured, and its services are backed by guarantees. No matter what time of day or night your bathroom toilet plumbing problem arises, do not hesitate to call Cape Shore Plumbing, your bathroom toilet plumbing contractor, at (239) 677-9544. Flush your toilet troubles away today! Remember, we don’t sleep so that you can.